Grace Renovation — Blake Canfield & Son, Inc. The Grace home underwent a complete first floor renovation-- taking down walls to remove an unused formal living room and make an open floor concept including a large kitchen and study space. Since the Grace Family loves to cook, having ample space to prepare, cook, serve food, and entertain friends was a top priority of this renovation. Wellborn cabinets in Glacier white with a Java glaze comprise the main sections of the kitchen and study. The island is a Maple Wood finished in Espresso. New Oak hardwood throughout first floor. The open study area that sits directly off the kitchen. 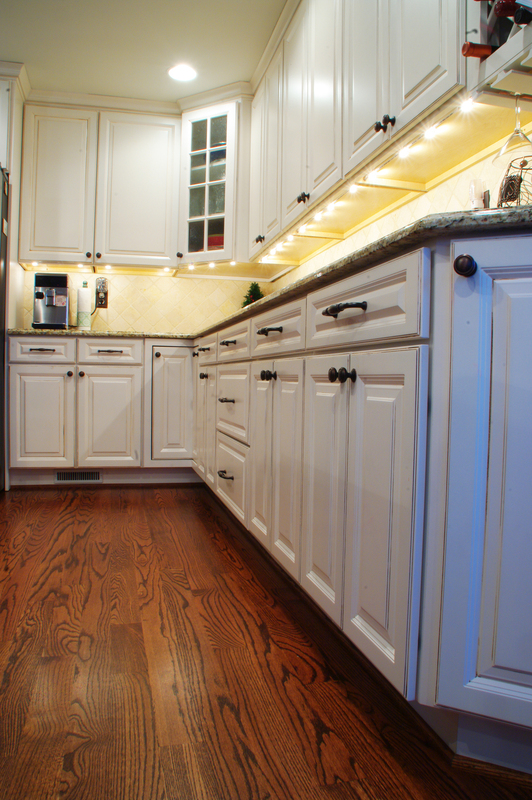 Beautiful contrast of the light cabinetry with the dark oak flooring. The kitchen island in Maple Espresso. The customer went to our granite manufacturer and chose their exact piece of granite to be used in the kitchen.